The Michelin Guide’s 2016 ratings for New York City restaurants was released last night and, not surprisingly, the list includes some of the city’s most expensive spots: Per Se, where the ten-course tasting menu will set you back $310 per person, Eleven Madison Park ($225 for a marathon 12 to 15 courses), and of course, Masa, where sushi devotees plunk down $450 for an extravagant omakase meal. Here’s the thing: chefs who cook well at night also cook well in the morning. Breakfast is a great way to sample an impossible-to-get-into spot without any hassle—and for a fraction of the price. Take the Breslin, April Bloomfield’s pioneering gastropub: Show up at 7:30 p.m. on a weekday and it might take you 10 minutes just to push your way through the packed bar area to get to the hostess, who will give you a sympathetic look as she tells you the wait for a table of two will be an hour and a half. But come at breakfast time and you can stroll right in like an A-lister. Order a cup of Stumptown coffee and baked eggs with spiced tomato and chorizo ($15) or a black forest donut with chocolate cherries and Chantilly cream ($5). Other Michelin-starred breakfast options include Café Boulud (try the brioche French toast with orange butter and passion fruit syrup for $14) and NoMad, where the $19 egg sandwich comes on a housemade English muffin with duck sausage and cheddar. It’s a not-so-well-kept NYC secret that many of the city’s most expensive restaurants offer very reasonably priced lunch options. At Del Posto, for example, you’d be hard-pressed to get out of dinner without spending at least $200 per person, but for $49 you can sit down to a three-course lunch of antipasto, secondo, and dessert (adding a course of Mario Batali and Lidia Bastianich’s legendary pastas is $10 extra, but worth every penny if you can swing it). Marea, Michael White’s Italian seafood temple on Central Park South, offers a two-course “business lunch” for $47, with a menu that includes the chef’s signature pasta with red wine­–braised octopus and bone marrow. (Or, if you’re feeling flush, you can go for the $80 five-course seafood tasting instead.) At Le Bernardin, sit in the restaurant’s less formal but still posh lounge and order the three-course City Harvest menu for $49 ($5 of which will be donated to City Harvest, a hunger relief organization). 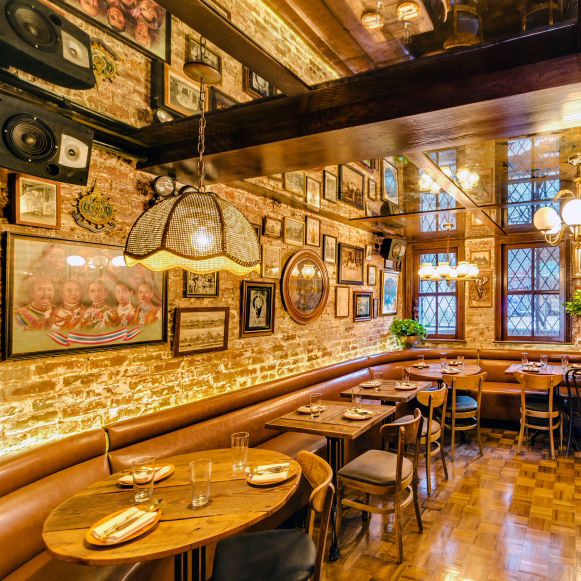 Or, if you’re in the mood for something simpler, but still life-changing, head to Williamsburg for lunch at Peter Luger’s, where you can order one of the best burgers of your life for $14.95 (but only before 3:45 p.m.). One of the best ways to experience a restaurant meal is at the bar, where you usually have an unimpeded view of the dining room and can quiz the bartender about what to order. At Aldea, where George Mendes serves beautifully plated Portuguese-inflected fare, you can sip a glass of sparkling Brut from Portugal’s Barrada region ($12) while dipping salt cod croquettes ($11) into roasted garlic aïoli and nibbling on creamy, briny sea urchin toast ($16). Similarly, the chef’s tasting menu at Gabriel Kreuther’s eponymous new restaurant might cost $185, but one of the chef’s signature tarte flambées—topped with crème fraîche, smoky bacon, and caramelized onions—can be enjoyed for only $12 in the restaurant’s elegant bar and lounge area. At Kreuther’s alma mater, the Modern, which just earned a coveted second star under the direction of chef Abram Bissell, the more relaxed bar room serves a well-curated menu of reasonably priced dishes, like fried oysters with pickled garlic rèmoulade for $19. The wonderful thing about the Michelin Guide’s list is that it includes a number of informal, well-priced neighborhood places that happen to serve exceptionally good food. At Café China, a Szechuan-style restaurant in midtown, appetizers like pork dumplings in chili oil ($6), mouth-tinglingly spicy dan dan noodles ($6), and garlicky cucumber salad ($6) are incredibly affordable; family-style entrées run between $11-$25 (try the spicy cumin lamb for $19). Down in the East Village at Somtum Der, which was promoted from Bib Gourmand to the one-star list this year, nothing on the menu of northeastern Thai specialties exceeds $15. Over in Queens, Long Island City’s Casa Enrique feels sleek and modern, but the menu is packed with traditional Mexican dishes like chile relleño ($16) and chicken enchiladas topped with a piquant salsa verde ($16), both of which can be washed down with one of their excellent house margaritas ($11). A few well-priced Brooklyn restaurants made the cut this year as well, including the Finch in Clinton Hill. Run by an alum of Gramercy Tavern and Blue Hill at Stone Barns, the cozy townhouse restaurant earned its first Michelin star this year. Although entrées cost between $16 and $28, the restaurant’s thoughtful, expertly prepared food is of a quality that far exceeds the cost of a meal.